This can be ascertained as belonging to the 14th Hussars thanks to the regimental specificities of his uniform : he is wearing the typical officers' busby with white plume ; it is specifically characterized by the absence of a boss, a long tradition in the Regiment, that will eventually be officially sanctionned in the 1900 in the Dress Regulations for Officers of the Army. 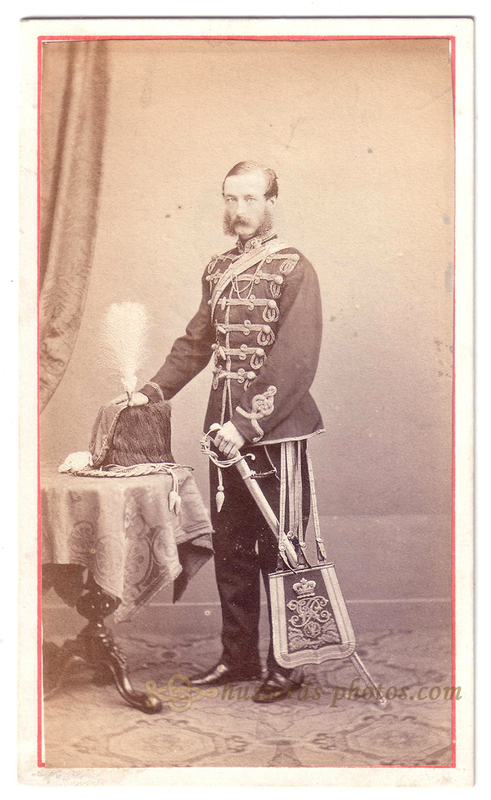 It is interesting to note that plaited cap lines are attached to his busby, a feature more usually associated with the 11th Hussars, but that seemed to have been fashionable in the 14th in the early 1860s. 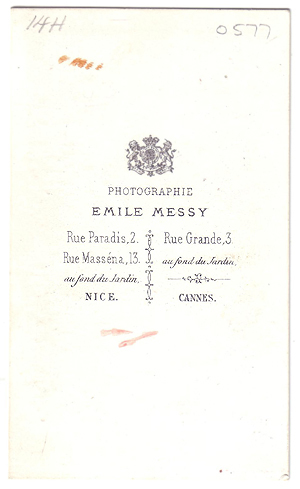 What's really intriguing here is that our Lieutenant's portrait was taken in Nice or Cannes : what could our Hussar have been doing with his full uniform on the French Riviera ? The backplate of the photographer bears the Royal Arms ; did Emile Messy rather make to trip to England ?